Will the proposed elimination of the paratransit bus service turn CCPT into a train wreck? Irresistible force meets immovable object. The force: Advocates for the disabled who are against the elimination of the paratransit bus service provided by Clinton County Public Transit (CCPT). The object: County officials who contend that unless the paratransit service is dropped the whole public bus system will fail due to cost overruns. Presently people in the disabled community use the paratransit service which provides door to door rides. This enables the disabled to conduct activities like able-bodied citizens: shopping, getting to work or to a doctor’s appointment. The county Planning Office proposes to shut down the paratransit service and shift its riders over to the fixed bus routes including those in the city. City routes run on a one hour schedule without much extra time for delays. North Country Center for Independence (NCCI) Director Robert Poulin says this will mean problems for all riders if this proposal is approved. Each city bus has a lift to accommodate riders with walkers and wheelchairs. Using this lift takes time, meaning delays. If more of the disabled are using city buses then the delays will keep accumulating during the day, he says, making everyone late. Also the new system means less area coverage for rural riders and it will run only on certain days during the week. "[The proposal] will leave a lot of people out in the cold,” he says. “"People who need the service the most have no alternative." At a recent meeting at NCCI advocates sat down with county officials to review the proposal, a discussion that ended up running for over two-and-a-half hours. Robert says the Planning Board officials had made up their minds and wouldn’t listen to any alternatives. Advocates pressed their case, winning a concession that the new system if implemented would operate under a three month trial. But that concession doesn’t mean advocates are giving up with their opposition to the proposal. "Our position is still that we absolutely oppose the elimination of paratransit in any way, shape or form,” says Robert. Addressing the issue of cost overruns Robert says the county could do a better job of containing costs. Planning Board officials reject a standard fee for all buses, saying that the city routes are paying for themselves. Robert explains a standard fee would help contain costs for the entire system. As NCCI director he doesn’t pit one program against the other at the center. Also if a program isn’t working that well, he adds, then he consults with other centers to see how they successfully run the same program. Robert thinks the county doesn’t take advantage of consulting with public bus operations in other communities for their expertise. Instead of taking time to look at alternatives, Robert says, the county takes the easiest solution. "In this county the answer seems to be 'cut, cut', and always cut from the people who need it the most." Advocates will keep resisting the proposal. There are upcoming forums where they will present their case. Robert says that NCCI has offered assistance for people in the community who are starting petitions. "We are going to explore every avenue because our goal is to stop this from happening,” he says. He rejects the message to people in the disabled community that they should just stay home. For more information on the upcoming forums and how to participate in activities against the proposal Robert can be contacted at NCCCI, (518) 563-9058, Ext. 101.
say advocates, will result in more delays for everyone. 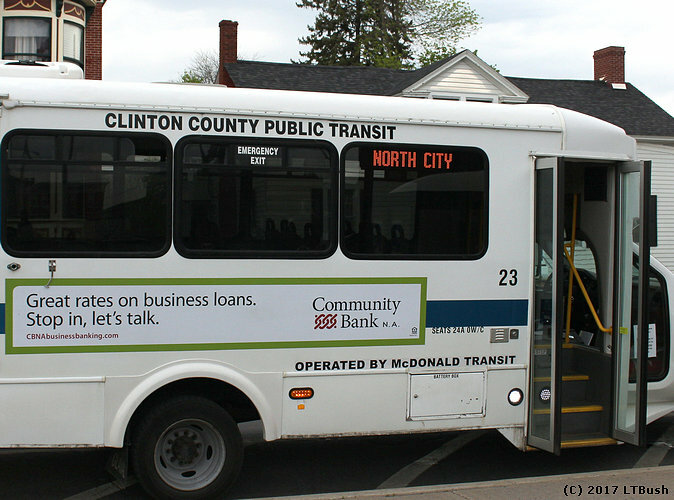 Advocate Patti King personally fears the proposed elimination of the Clinton County Public Transit (CCPT) paratransit service might lead to an unfair backlash against the local disabled community. 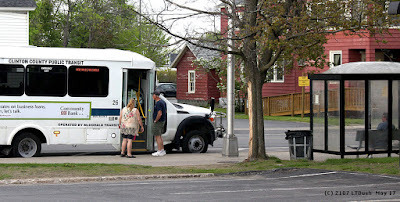 Presently the public bus service operates fixed routes and a paratransit service for the disabled. The fixed routes – city and rural – run on a timed schedule. The paratransit service is flexible, allowing door to door service. CCPT is putting forth a proposal to eliminate the paratransit service and have all riders use the fixed route system. To help the disabled CCPT will allow deviations from the fixed routes up to ¾ of a mile. Fixed route buses have lifts for riders using a wheelchair or walker. The city service has to maintain a schedule, one hour to complete each route. When a disabled rider is picked up it takes time to get that person on and off the bus. Wheelchair users must be strapped in, adding additional time. Serving as a board member for the North Country Center for Independence Patti attended a meeting last Friday at NCCI for advocates and country officials to discuss the proposal. The meeting ran on for over two and a half hours, each side trying to make its point. Clinton County Planning Director Rodney Brown who also serves as the county ADA (Americans with Disabilities Act) Coordinator said the county is running deep into the red due to cutbacks in Medicaid reimbursements for paratransit. The proposal would help to cut costs. Patti and other advocates contend the change is impractical. There will be too many delays with the additional riders from the eliminated paratransit service using the fixed routes. In the past there have been incidents where able-bodied riders complained about the delays to accommodate people in the disabled community. “We [advocates for the disabled] made it unyieldingly clear at the meeting we don’t support the change,” Patti says. She thought the system would probably implode from the chaos. She worries when the new system fails it could be an excuse for the county to shut down the entire service. Two meetings will be held at the Clinton County Government Center first floor conference room to explain the proposal. The first on June 5th is open to the public, scheduled for 10 AM to 12 noon, and the public can be involved in the discussion. The second meeting on June 6th , also from 10 AM to 12 noon, is for agencies affected by the change. The public can attend but won’t be allowed to participate in the discussion. A large computer screen is recommended.